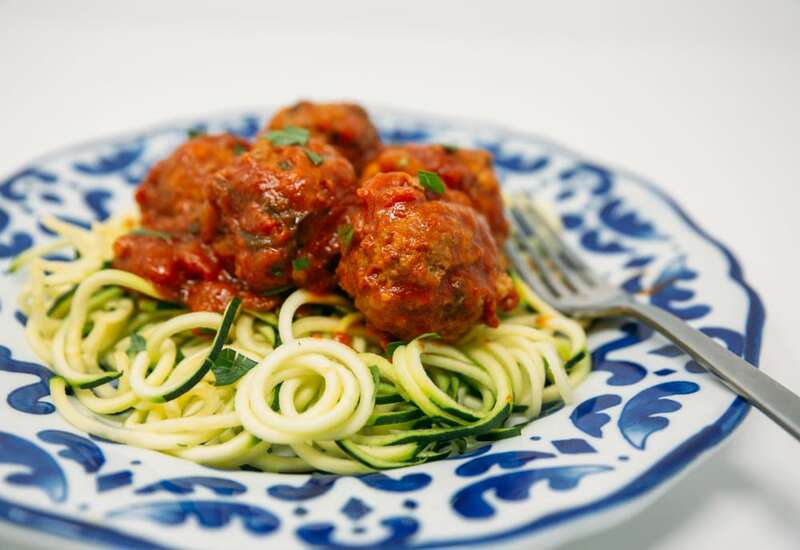 Make these meatballs a part of your meal plan repertoire, toss them into the rich and comforting marinara sauce and have them with your favorite pasta alternative, the healthy evolved zoodle that's loaded with all the flavor minus the carbs! You can prepare your meatballs ahead of time and fire them when you're ready to eat them! Have your pasta ready to go in the pantry if you're hosting a dinner gathering for those folks who need to have the traditional combination. Per Serving: 562 calories; 37g fat; 15.3g carbohydrates; 41g protein; 172mg cholesterol; 913mg sodium. This is a solid, if not too spectacular, dish. The meatballs are pretty good. The marinara is solid. I would suggest having this in your arsenal of spiralizer recipes. You can hardly get a better straightforward place for zucchini noodles than "spaghetti and meatballs". I've made this recipe twice in the last week, once with zucchini noodles and once with sweet potato noodles! The meatballs and marinara sauce are so good! Refrigerating the meatballs is key, even if only for 5 or 10 minutes.